Milos' next match will be versus Stanislas Wawrinka. He'll be on Grandstand (a televised court) not before 6AM Eastern Time, but maybe as late as 8AM Eastern Time. Stan has beaten Milos in their only previous meeting at Cincy 2012. Stan's been playing well lately so it will be a challenging match... if only we didn't have to be at work in the morning : ). Despite help from his countryman, Raonic still can't pass Gasquet for No. 9 in WTF race this wk unless he makes SFs. Not over tho. Oct 7th: Still on the Asian swing, Milos plays this week in Shanghai, starting at 8AM Eastern Time Tuesday (tomorrow, not before 8PM in Shanghai, Tues, 8 Oct). The time difference between Eastern Time here in Canada and Shangai is 12 hours, so subtract 10 and a half hours to get Newfoundland Time : ). Raonic will face Qualifier Michal Przysiezny of Poland. Also in action tomorrow is Vasek Pospisil, who will take on Richard Gasquet around 4am Eeastern, tomorrow. Posted by wacb from WordPress for BlackBerry. Milos receives a wild card into Stockholm. Winnable field for him with Ferrer as the only player ranked higher. Win would help him but not as much as the final two tournaments. It’s a good move. Seeded 2nd, in time for the draw; SF or better can replace his 45 points from Washington, correct? As you indicate, Milos still has a long-shot at the ATP-WTF, if he does very well at Basel and Paris; but realistically his goal will be to keep that alternate spot, and solidify his status in the 9-12 bracket to start off the 2014 season. I know im probably the only to say this but this looks like a bad move. This is the 4th week in a row playing and 2 more coming. I only hope he dosent get injured. Risky? Maybe. Bad? Well I would say it’s bad only if his physio and team don’t keep a close enough eye or they do and Milos goes against their advice not to play. I think Milos has a better idea of what his physical limits and abilities are compared with the Wimby scenario- he’s more mature now. He’s not going for every point, grinding out long baseline rallies, and over-stretching himself. Besides, he’s probably hoping that many of the matches in this tourney will be short ones. Not like he’s defending a bunch of points or anything. He’s got nothing to lose even if he does go out in the first round. I have a feeling he’ll be taking it easy : ). Pathetic as hell im glad i jus watched last game of the match. 3 2nd serves from Wawrinka and in the back of the net from Milos. With this returning he aint gonna make any progress further. Annoyed and dissapointed he played like crap. And Wawrinka for most the last 2 weeks playing like a challenger player and suddenly he starts playing very good against Milos. He should buy tickets to Anderson for choking soo hard against him. Definitely disappointing though I’ll chalk it up to fatigue. Agreed that his return game definitely needs improvement, but he also had a great Asian swing and hasn’t had to go deep into a tournament 3 weeks in a row before. Unfortunately Wawrinka is going to get further away (I could see him beating Nadal too if Nadal plays like he did today), Tsonga looks poised for a deep run too. It looks like his best chance at playing in the WTF is as a replacement right now. A good finish to the year could still see him at the year end top 10 in the rankings. If were lucky maybe a good run at the final masters tournament will help him squeak in, but two of Federer, Tsonga, Wawrinka and Gasquet will need to falter. If he carries this form into next season for a full year there I believe he quite easily makes the WTF, even with his return game where it is. A lot of missed points on clay and grass that could have helped him qualify. Just a corection he need to squeak in but 3 of the four must falter as murray is not playing in finals. Roger Federer just lost to Gael Monfils. This may add pressure to Wawrinka. Ferrer also lost to Mayer, giving Tsonga a nice route likely to the semis. Milos needs to beat Wawrinka today to stay in the race. 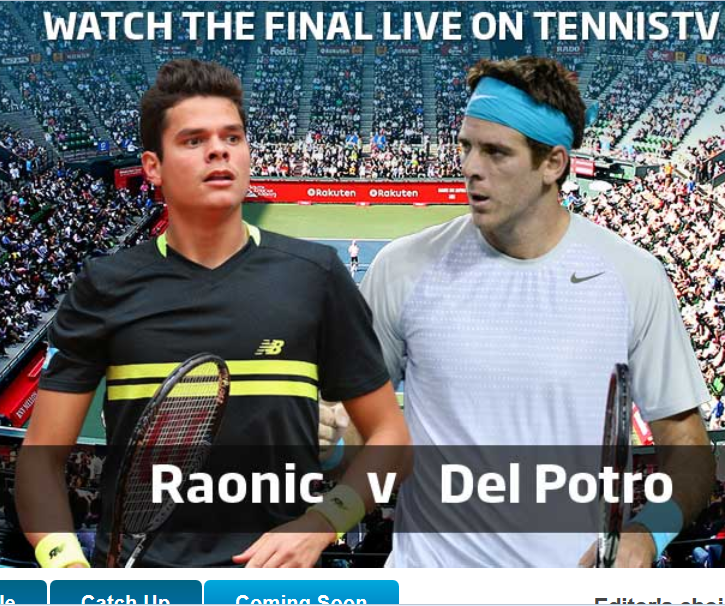 Very disappointing that sportsnet has yet to cut to the coverage of Milos’ match. First time that I can recall that they haven’t done this while he’s on a television court. He will need everything in store to win this. I’ve seen the future: Canadians in the 1 and 2 spot. Lengthy comparisons of their respective styles. Debates over the G-COAT. Milos is up against Verdasco now. I think he can make the semi-final here somthing tells me Nadal will lose early. Looked from the scoreline that he struggled a bit. He’s played a lot of tennis the last few weeks I hope fatigue is not setting in. Very important match tomorrow for him if he has hopes to qualify for the WTF. Last 2 games on his service were incredibly bad had to work for the points. He might be tired after 3 long weeks but lets hope he get atleast 1 more win tomorrow. Next week he can rest and prepare for Valencia or Basel? I hope Milos is smart and will play the weak field in Valencia because it would be madness to go in Basel with all tops there. Good luck to both Milos and Vasek tonight! If Vasek can take Gasquet out, and that ultimately opens up a spot for Milos at the ATP WTF, I will personally start up a collection to buy Vasek a ticket to watch Milos play! Still Milos needs to make the SF to get past Gasquest. Lets take it step by step. He is playing in one hour. Convincing Win for Milos, now Plays Verdasco. I don’t think Milos can make Semis BUT if he reaches QF I’m happy. That would reduce the deficit to Gasquet to 100 Points.